Oh hey, look. Another day, another news report about a new Mazda RX-7 that's in the works, for real, and is really gonna hit the streets and be sold to actual humans in just a few years. Really. Seriously! If you just rolled your eyes and then slammed your head against your desk, then you and I had the same reaction to this piece in Autoweek that says "Word on the street has Mazda resurrecting the Mazda RX-7, this time as an agile, lightweight, two-seat coupe with a next-gen 250-hp rotary engine." Sigh. Oh, God. Here we go again. Let me preface this by saying that I like Mazda. And the rotary engine. 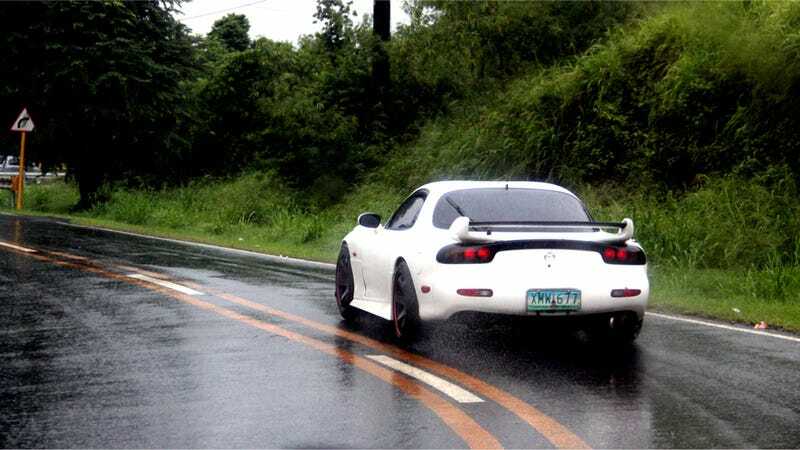 And the RX-7! I'd absolutely love to see a new one on the road again someday. And I like Autoweek too, they do excellent reporting, and I don't think they're just blowing smoke up our collective asses here. The problem is that we have been hearing rumors and supposed insider reports about "a new RX-7" in various places since the old car left the U.S. in the 1990s, since it was killed off in Japan in the early 2000s, through the entire lifespan of the RX-8, and at least a few times every year since then. Let's trace Jalopnik's own history of writing about the "new RX-7." In 2009 "The Auto Insider" said a concept would appear at the Tokyo show; Ray Wert said that same year that the it would replace the RX-8 and be on the road in 2011 or 2012; Sam Smith in 2010 said it would be turbocharged; we in late 2012 reported with a heavy dose of skepticism on a new one coming "sometime"; and then I wrote last year that Mazda CEO Masamichi Kogai himself said there are no plans to resurrect the rotary because it's not commercially viable. And now, today, we have a story that claims executives privately say plans for a new rotary sports car are underway. Again. We've been hearing this story now for longer than some Jalopnik readers have been alive. You have to see this from Mazda's perspective too. They're now a small and independent automaker with a limited bank compared to bigger companies, and while they've turned out great products in recent years like the new 3, 6 and CX-5, they're not really in a position to gamble on a rotary sports car. If a new RX-7 was in development in the last decade, I'd be willing to bet the recession and sale from Ford put the kibosh on it. Also, automakers are more focused ever on making engines that are efficient, good on emissions and reliable. While the rotary is a ton of fun and has attributes that make it excel on a track, those three things have never been its strongest suits. And yet still, the reports about "the new RX-7" continue to surface. It's weird. To be fair, Mazda isn't alone in this — how long have we been hearing about a new Toyota Supra now? Just as long, although considering Toyota's sports car partnership with BMW, we may actually see something materialize there. Maybe. You want the specs on "the new RX-7"? Okay, according to Autoweek, it won't be turbocharged (hah! ), it won't be a hybrid-electric, it could have an engine smaller than the RX-8's 1.3-liter mill, it may have two or three rotors, it will weigh about 2,800 pounds, and it's aimed at the BRZ and FR-S. The new RX-7 sounds really promising. Expect it on the road in the second quarter of never.